The Damon Comfort System of advanced passive self-ligating brackets, high-tech light-force archwires and minimally invasive treatment protocols provides remarkable advantages for both the doctor and the patient. The Damon Comfort System is clinically proven to dramatically reduce treatment times, provide exceptional results, and significantly improve patient comfort. With the Damon Comfort System, the traditional steel and rubber band ties have been eliminated, and a sliding door assembly replaces the traditional handle on the front of the bracket. Wires are secured to the bracket without the need for ties and their added friction and forces. These improvements make the Damon Comfort System brackets nearly friction-free. 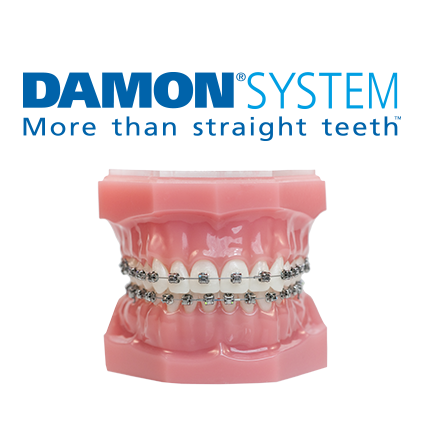 Damon passive self-ligating braces that eliminate the need for elastic or metal ties. With Damon tie-less braces you can experience treatment without tightening. Light, heat-activated, shape-memory wires that move teeth faster and require fewer adjustments. A new clinically proven treatment approach that aligns your teeth and enhances your facial esthetics, typically without the need for extractions or rapid palatal expanders. Please call our office today at 714-990-5414 to find out if the Damon Comfort System is right for you.